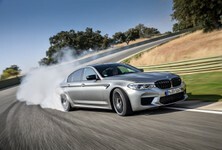 The all-new, all-wheel-drive BMW M5 is here. 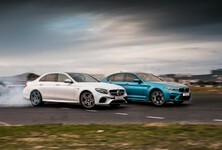 We conducted a comprehensive test of the 441 kW 'bahnstormer, including a sparring session with its Mercedes-AMG rival, to reach our verdict on the latest iteration of BMW's super saloon... As it becomes increasingly sophisticated, can it still deliver performances worthy of its iconic nameplate? We like: Ballistic acceleration, all-wheel-drive grip, superb handling, easy to drive in whichever mode it's in, loaded with tech. We don’t like: Needs a meatier exhaust note (bring on the M5 Competition! ), understated looks. The other ballistic Teuton: The Mercedes-AMG E63 is the key nemesis of the BMW M5. It features a more exciting cabin and we'd say it has a better-sounding exhaust too. It too boasts awe-inspiring all-wheel-drive performance capability. How about a Porsche: The Panamera Turbo has come along in leaps and bounds. In its latest incarnation, it offers enough prestige to sway BMW and Mercedes-AMG customers, but the Turbo isn't as fast as its countrymen... and it's significantly more expensive. A station wagon? The Audi RS6 Avant is still available for sale in South Africa and despite an all-new A6 being launched internationally, this model continues to endear itself to its fans. It's raucous and fast, but, as a wagon-only model, its appeal is limited. Sedan too boring? What about an SUV? The SUV market is on fire at the moment and performance versions are proving popular. Take your pick from the BMW X5 M, Mercedes-AMG GLE 63 S, Jeep Cherokee SRT8 and Range Rover Sport SVR... all of which offer forced-induction V8 performance in combination with all-wheel drive. As each successive BMW M5 comes to fruition, the "tweed-capped purist" must feel as if another part of their soul has been chipped away. You see, the BMW M way of life has typically followed this recipe: rear-wheel drive, a rev-happy naturally-aspirated motor and a manual 'box. In fact, many would say the last iconic BMW M5 was the 5.0-litre V8-engined E39, an absolute peach of a machine far greater than the sum of its parts. The E60 version was a defining moment for the M5 family as it featured an F1-inspired 5.0-litre V10 engine, but it received a black mark against its name due to its SMG transmission. The North American market was fortunate enough to get a manual derivative, but the rest of us were stuck with the SMG single-clutch semi-automatic transmission. It wasn't the smoothest at slower speeds, often resulting in jerky progress. This also marked the start of the user-defined era as you could switch from already-potent 294 kW (400 hp) to the ballistic 373 kW (500 hp) at the touch of a button. The F10 marked another new chapter in M5 lore as it introduced turbocharging into the mix. Some lamented the loss of the naturally-aspirated V10 with its glorious soundtrack, but in reality, the turbocharged V8 engine was a lot more flexible. You could access all that power quicker and it was devastatingly fast, both from a standstill and in terms of in-gear shove. Again, the North American market was the only one to get a manual gearbox as the rest of the world would make do with the improved 7-speed dual-clutch transmission. 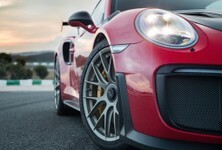 One major criticism of the car was the turbochargers neutered the soundtrack of the quad exhausts, something that wasn't quite rectified with the Competition and Pure Metal special editions. In simple (non-corporate) language, that's to say you can have a great time driving the new BMW M5 quickly without the residual fear that it will ever "bite your head off". In other words, it's unlikely to catch you out as it approaches its adhesion limits. For purists, all-wheel drive is best reserved for Audi RS models, but for the rest of us, who want to feel confident enough to drive the new BMW M5 spiritedly in most conditions, this is brilliant news. Interesting trivia: Van Meel used to work at Audi Sport, so if there's anyone qualified to develop all-wheel-drive super saloon vehicles, it's him. Snapper Rocks Blue is one of the best colours for the new BMW M5, but aficionados may prefer one of the more characteristic M colours. Mechanically, this all-wheel-drive system is not just a piece of tech nicked from the BMW X family. The M-specific all-wheel-drive system (M xDrive) has been developed purely for the BMW M5 and the best part is you can disable the front axle and make it a pure rear-wheel drive vehicle. Note, however, that this mode requires stability control to be completely disabled so you had better have your wits about you. On the other side of the coin, indulgent burnouts and graceful sideways drifts are just a stab of the right foot away. We've experienced this briefly and... it's addictive. But for all of its sideways smokey craziness, we still need to evaluate the new BMW analytically and determine whether it's worth your attention. The seats are sporty and supportive, and rear legroom is fair. New M5 is both fast and practical. The 7th-generation of BMW 5 Series is slightly longer and wider than before, but thanks to the extensive use of aluminium in the body panels, underpinnings and suspension have resulted in a car that’s lighter than its predecessor, which bodes well for improved performance, handling and efficiency. All of which is impressive, considering the additional weight added by the M xDrive mechanical components. And, lest we forget, there are many of the technological highlights of the BMW 7 Series that are now available in the 5 Series, several of which feature in the new M5. For those who value practicality, the F90-generation M5 can still perform family sedan duties with aplomb. Rear legroom is fair for adult occupants, the boot is more than capable of swallowing 2 sets of golf clubs and there's ample headroom for everyone, except perhaps a Springbok lock forward. The seating position is generally good, although the driver is perched a little higher than expected. The M multifunctional front seats offer multiple avenues of adjustment, considerable lateral support... and there's an illuminated M logo in each of the headrests – which is a great touch. Customise to your heart's delight: Suspension in Comfort, Engine in Sport, Steering in the mid setting and Exhaust active was our preferred combination of settings. Being the flagship model in the 5 Series family means you get an awful lot of interior features as standard, but you can opt for some extra-cost options, some of which are certainly worth looking into, such as the uprated ceramic brakes, for example. BMW ConnectedDrive, Apple Carplay, satellite navigation with real-time traffic, a wireless charging pad, adaptive headlights, 4-zone climate control, infotainment with gesture control, 360-degree parking camera and tyre pressure monitors are just some of the features that come standard in the new BMW M5. In terms of options, consider the M carbon ceramic brakes (R128 200), the semi-autonomous driving tech (R20 900 + R24 800), heated and ventilated seats (R9 800), front-seat massage function (R14 400) and perhaps the uprated Bowers & Wilkins surround sound system (R42 600). You can disable the all-wheel drive and switch to rear-wheel drive only, but you'll have no stability control. If you know what you're doing and not using a public road, magnificent drifts are possible. This image was shot at Killarney Raceway. Now let's get down to business: what the M5 is like to drive. With the critical switch to all-wheel drive, a new transmission and a revised engine, the new BMW M5 was never going to be slow. Better yet, all-wheel drive doesn't just give the new M5 an incremental increase in pace, but rather a massive one, so much so that in a straight-line sprint, the previous generation would be resoundingly trounced. Let's examine the numbers in detail. Power comes from a revised version of the 4.4-litre twin-turbocharged V8 mated with a conventional auto transmission. Outputs of 441 kW and 750 Nm may not sound dramatically higher than those of the previous generation (412 kW and 680 Nm), but thanks to the all-wheel drive, acceleration is much more savage. The claimed 0-100 kph sprint time is now down to 3.4 seconds, almost a full second quicker than the previous version. Unlike some launch control systems, which hold the car dead still as the revs build, the M5's setup sees the Bimmer squirm uneasily as it attempts to control the rampant horses in its engine bay. When you release the brakes, there's a moment's pause before the electronics work in unison to sling forth 1 850 kg of BMW M5 with explosive force. The feeling is surreal; if you've never experienced it before, your body will have to deal with being mashed down in your seat. Is this what fighter pilots experience each time the steam catapult on an aircraft carrier fires their jets into the sky? The two red buttons unlock the BMW M5's potential. We used M2 with discretion, because it was programmed to disables stability control. So, we've discovered the Bimmer is brutally fast, but it is so much more than a straight-line charger. Thanks to an assortment of selectable settings, the car can be configured to suit a driver's mood, plus there are 2 red switches on the steering wheel that instantly maximise the car's potential. Given the breadth of its engine's abilities, the vast majority of vehicles in the M5's path can easily be overtaken in Comfort mode. However, if you extend your left thumb and press the red M1 switch – one seemingly reserved for supercar hunting – the M5 goes into its most aggressive setting, with the engine at its most responsive, suspension optimised for ultimate sportiness/dynamism and steering weighting at its heaviest. M2 button does all of this too, but turns off the traction control – not something we'd recommend unless you're headed to the relative safety of a race track. If the road lends itself to testing the super saloon's handling prowess, the near-2-tonne Bimmer reacts decisively, provided the course isn't too tight (in that scenario, the M5 can feel every one of its kilograms; you may find yourself stomping the brake pedal incessantly). Although the jury's still out on the somewhat insular feel of the steering, the M5 turns in promptly and crisply. It's deceptively agile for a large car with admirable body control. Hamfisted manoeuvres in the old car would have had you sliding and fighting to keep it under control, but that wild rear-end is all gone... When you power out of a corner, the all-wheel drive, combined with a more linear power delivery, facilitates amazing traction and exit speeds. Stopping power is immense too, by the way, but we'll ascribe that to the optional M carbon ceramic brakes – well worth looking into if you want to drive your BMW M5 enthusiastically for extended periods, when normal brakes may show signs of fading. Interestingly, both the M1 and M2 buttons are completely programmable so you could set M1 up for the most comfortable and docile settings and M2 for everything at its most expressive. There's something mature about this generation of BMW M5. Sure, it can be absolutely devastating in its most aggressive mode, but its relaxed, docile nature (when you're not swatting everything aside this side of a Porsche 911 Turbo) is something we appreciate. See, while we all dream of driving to work on a de-restricted autobahn or an abandoned alpine pass, the reality is that you'll spend the overwhelming majority of your time drudging through traffic jams. This is where the car's 5-Series platform comes to play and comfort/ease of use is highly sought-after. The steering weight can be adjusted and at its lightest setting, rotating the tiller with one finger is entirely possible. You can even switch off the active exhaust, to avoid disturbing the neighbours. Cheekily, the default setting is active exhaust ON, which makes for grin-inducing cold morning starts. The BMW M5 is quite happy to trundle in traffic at 60 kph with its semi-autonomous technology taking care of the following distance and making minuscule corrections to the steering to keep the vehicle within its lanes. The driver, at this point, doesn't actually have to do much but relax in comfort, thanks to those lovely front sports seats. With those raging horses safely tethered and the car's demeanour at its calmest, the M5 feels like a normal executive sedan, one that you could easily use to transport your family to its holiday destination. You'd only get a whiff of its capabilities when you overtake vehicles on the open road and even in its most docile setting, it's scary how easily the M5 drifts over the national speed limit. We're glad to see this feature available, but be careful as there is no safety net! The BMW M5 is available in two flavours: normal M5 and M5 First Edition. BMW says the South African consignment of M5 First Editions is sold out, but we'd bet that if you looked hard enough, one would turn up. 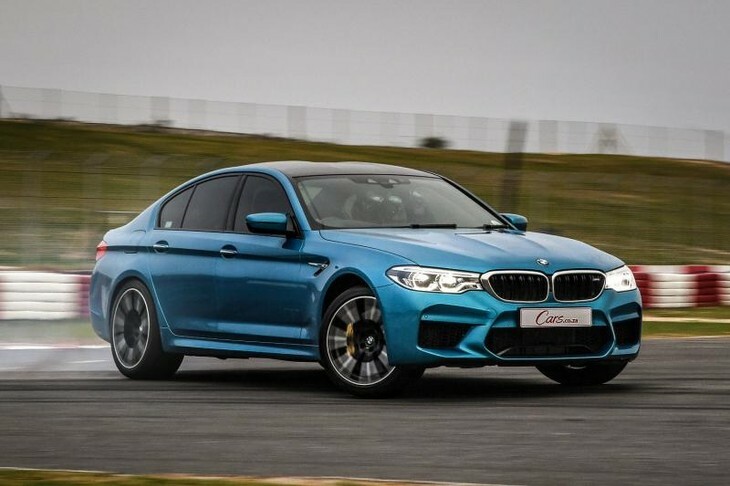 There's also a faster and more agile M5 Competition model that will land in SA before the end of the year. The vehicle comes with a 2-year/unlimited kilometre warranty and a 5-year/100 000 km maintenance plan. It's a new chapter for the BMW M5 and we're happy to embrace its all-wheel-drive tech, which offers more performance as well as provides a cosseting safety net. While some will lament the adoption of all-wheel-drive in the BMW M5, the harsh reality is that the car is better for it. Its (considerable) performance envelope is far more accessible, the car is more manageable on the limit and critically, is safer when conditions change (few were brave enough to hustle the previous-generation rear-wheel-drive M5 in heavy rain, for example). The switch to all-wheel drive has also done the unthinkable: it's put Audi's RS division in a very awkward position. With all respect to M versions of BMW X models, the performance all-wheel-drive setup in the M5 is so multi-faceted it begs the question why generations of quattro-equipped RS Audis have felt less-than-engaging to drive? Of course, you can have a blast from the past and engage rear-wheel-drive for proper sideways tyre-shredding action, provided you can afford multiple sets of fresh rubber. The battle between day-to-day comfort, technology and efficiency on the one hand, and living true to the ethos of the M5 on the other, will continue to rage on, but if this F90 is anything to go by, it appears that BMW will be able to satisfy both camps. It's exquisite to drive at full tilt when the road is clear, yet you'll be perfectly ensconced when commuting to work on a cold Monday morning. Our only gripe? We just wish it could be a tad louder. Searching for a BMW M5?